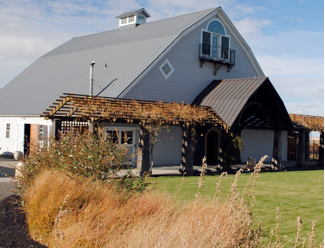 Abeja – Spanish for bee – is located east of downtown Walla Walla in a beautiful setting that houses the winery and a Bed and Breakfast. Winemaker John Abbott had been studying veterinary medicine at Oregon State University when he developed an interest in the science of wine production. After taking a sensory evaluation course, he decided to transfer to Fresno State to study viticulture and enology. Upon graduation, Abbott intended to return to his native state of Oregon to focus on its signature grape, Pinot Noir. However, after stops in Napa Valley’s Pine Ridge and Acacia wineries, his interests began to change. When an opportunity arose at Canoe Ridge Vineyard, he took a chance, moving to Washington in 1994. After eight years at the winery where he established a reputation for Cabernet and Merlot, Abbott left Canoe Ridge in 2002, founding Abeja with his friend Ken Harrison in 2004. 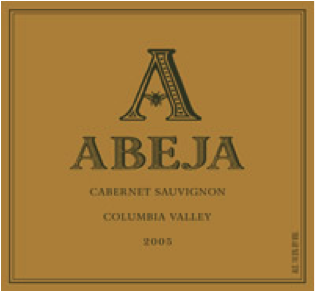 Abeja focuses on Cabernet Sauvignon along with limited bottlings of Merlot, Syrah, Chardonnay, and Viognier. In select years - thus far only 2002 and 2005 – the winery also releases a reserve Cabernet blended from their best barrels. On this weekend, Abeja was releasing their 2008 Chardonnay and 2007 Merlot. Abeja’s Chardonnay is consistently one of my favorites in the state. While their 2007 Merlot was locked up fairly tightly, the winery was pouring a 2004 vintage of the wine to give an indication of where they thought the 2007 vintage was going. Abeja also gave a sneak preview of the 2008 House Wine that will be released in the Spring. For a wine barely a year old, it shows great promise. Abeja produces 4,000 cases annually. Red wines sampled at 63 degrees. Rating: * (Excellent) Pale in color. Nose marked by mineral, freshly sliced apples, and light oak spices. Crisp and spritely on the palate with the oak influence far in the background. 100% Chardonnay from Celilo, Conner Lee, Gamache, and Kestrel vineyards. Aged in 100% French oak (50% new). 13.8% alcohol. 669 cases produced. Sampled at 58 degrees. Rating: * (Excellent) Nose is locked up and oak-driven at the moment showing toasted, smoky oak, pencil lead, and vanilla aromas. Tart and tight on the palate with a compact ball of fruit that needs time to expand. Give two years. 91% Merlot, 9% Cabernet Franc. Bacchus, Dionysus, and Gamache vineyards. Aged in French, Hungarian, and American oak (60% new). 14.6% alcohol. 659 cases produced. Rating: * (Excellent) An intriguing nose with ground spices, red fruit, and clove. Full and round on a palate that has an almost meaty quality. A bit tart at times. A slow, smooth descent on the finish. 100% Merlot. Sagemoor, Bacchus, and Katherine Leone vineyards. Aged in French, Hungarian, and American oak (60% new). Library wine. Rating: +/* (Good/Excellent) Lots of vanilla, cinnamon, oak spices, and red and blue fruit on the nose. Drinking extremely well on the first half of the palate and then flattens out. Will improve with additional bottle age. 78% Cabernet Sauvignon, 12.2% Merlot, 4.9% Cabernet Franc, and 4.9% Petit Verdot. 14.5% alcohol. 1,040 cases produced. To be released Spring 2010.